As we mentioned in our article “A Must Have French Cheese: Fromager D’Affinois“, although no one can tell exactly how many cheeses are produced in France, a common saying is that there are as many cheeses in France as there are days in the year (in fact probably many more). Today we are looking at another French cheese: the cheese Roquefort. 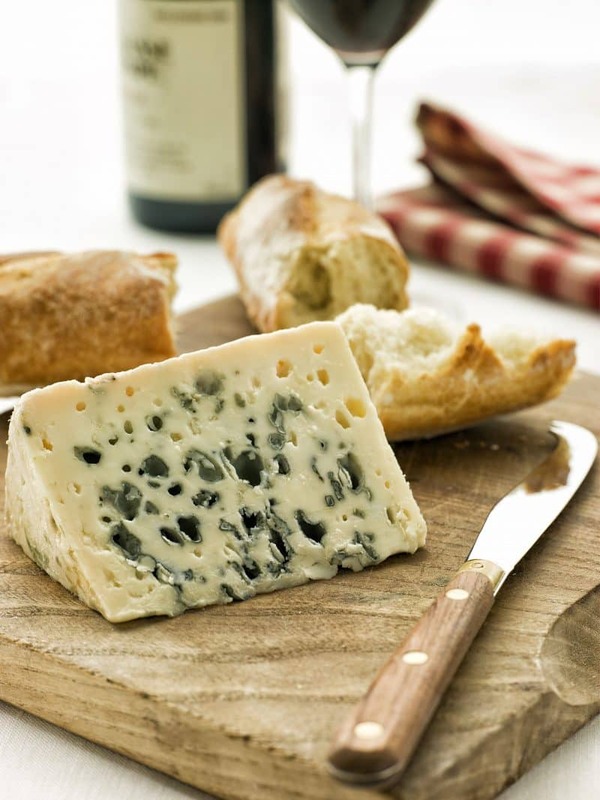 The cheese Roquefort is one of the most popular blue cheese in France and likely one of the oldest cheeses. In fact, the story goes that back in medieval times, the cheese Roquefort was Charlemagne’s favorite cheese. Many centuries later, the cheese Roquefort has a guaranteed spot on most French “plateau de fromages” (cheese platter). Keep in mind that, a cheese Roquefort has a strong smell, its texture is not as creamy as other blue cheeses made with cow milk and its flavor is quite pronounced. But if you like a stronger cheese, we highly recommend it and when served with a full-bodied red wine, a cheese Roquefort is at its best! Cheese Roquefort Made In Roquefort-sur-Soulzon: Where the Magic Happens! The cheese Roquefort is made with whole milk from a particular ewe (brebis) breed — the Lacaune ewes. In order to get the recognizable red ewe stamp (label brebis rouge), the cheese Roquefort wheels must mature in caves located in the village of Roquefort-sur-Soulzon in the Aveyron region (South West of France). Those natural caves contains “fleurines” (little cracks inside the rock that allow air to flow inside the caves). The humid currents created by the “fleurines”, along with the penicillium roqueforti spores born from the cheese Roquefort making process creates the blue veins and small holes typically seen in a cheese Roquefort. As the speaker says in the video below, the cheese Roquefort is — a providential marriage between a happy random geological event and the irreplacable “savoir-faire” of mankind. The video is in French but it will give you nice views of the French village where the cheese Roquefort is made, the special Lacaune ewes, a French lady cheese-maker passionate about the making of her cheese Roquefort, and of course the magical caves in Roquefort-sur-Soulzon where everything happens. It’s interesting to know that the caves have no air conditioning — the temperature is regulated by an all natural process. Visitors can tour those ancient caves — it is fascinating to see this underground village with multiple stories, each with its purpose. In fact, I still remember visiting them as a child and if you are ever in this region, it is a must see tour.